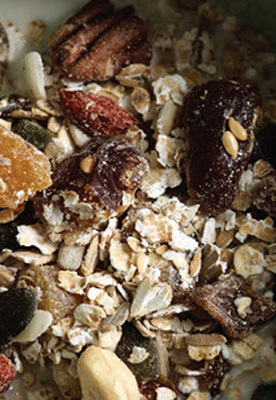 The combination of quinoa, kamut, seeds and nuts in this nutritious breakfast recipe offers a great source of protein. * Preheat the oven to 180°C/160°C fan/gas mark 4. * Mix the grain flakes and bran (if using) together and spread out thinly (6-8mm thick) over a baking tray - you might need two. Bake for 6-8 minutes or until the grains feel lightly toasted (rather than browned) when you turn them over with a spoon. * Once cool, transfer to a large bowl, add the remaining ingredients and stir together. Keep in an airtight container.